2012 US OPEN SERIES: Bank Of The West Classic Welcomes Serena In Sweet Style! 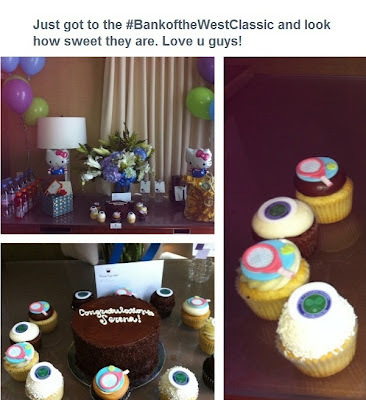 2012 Wimbledon Champion Serena Williams made her arrival to Stanford, California for the Bank of the West Classic today and was welcomed with lots of sweet treats celebrating her fifth Wimbledon Championship title. Serena will begin defense of her Bank of the West Classic title during the Day Session on Wednesday, July 11 at the Taube Family Tennis Center on the campus of Stanford University.